Dee Dee Blasco, Sky Silvestry: We must not look at goblin men. Biff Cane, Sky Silvestry: What’s that supposed to mean? The Doctor, Sky Silvestry: It’s a poem. Christina Rossetti. Dee Dee Blasco, Sky Silvestry: We must not look at goblin men / We must not buy their fruits / Who knows upon what soil they fed / Their hungry, thirsty roots? The Doctor, Sky Silvestry: Actually, I don’t think that’s helping. Following the natural course of things as they tend to happen in my world, I went diving for pen and paper and jotted down a note to remind me to look this up later. During my next trip to the library I therefore found myself poking round in the basement, and then up on a rickety stool where jammed between other equally tattered old books, I found a tiny blue one with gold on the edges of its pages. The cover was literally held on by the “BSMT 821 ROS” sticker on the spine. 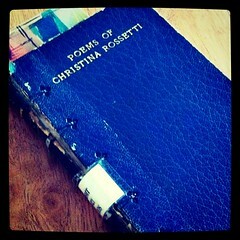 Poems of Christina Rossetti the cover whispered. When I brought it upstairs the library director herself was surprised to see it, and we exclaimed together over the 1913 publication date. All that seems rather lovely and magical to me, in a completely wonderfully ordinary way. Apparently Rossetti was fairly prolific and enjoyed critical and public praise from the publication of her first poems in th 1850s until she died in 1894. Her most well known poem was the one I wanted – Goblin Market. A long poem, it was written as a fairy story for children, and is about two sisters who come dangerously close to losing themselves to the spells of the goblins. Critics are all over the place about what the poem means, suggesting that it is an expression of Rossetti’s feminist political views, or makes a statement about female sexuality in relation to Victorian social mores, or the exclusion of women from the world of the arts, or that it is a criticism of Victorian marriage markets, or the rise of advertising in pre-capitalist England… There is a sense of the moralistic story to it, but instead of having the girl who slips up and sins die in the end to prove the danger of giving in to temptation, Rossetti lets her be saved by her sister, live, and go on to have a happy marriage and children. It’s a nice poetic adventure where sisterly devotion saves the day – with a whole lot of rather suggestive imagery. I for one have never eaten a piece of fruit with quite that much sucking involved, nor have I been eager to have a sibling lick juice off my cheeks and neck. Um. Goblin Market does seem to be more than just a children’s fairy story, but what it is exactly is beyond me. Having followed this thread and tracked down this poem, I am left feeling shruggish. I don’t particularly care for this or any of the other poems I have read. There is little about Rossetti’s phrasing or imagery or rhymes that speak to me, and I’m not particularly interested in her devotional or romantic pieces. So I think I’ll leave it at that, and close the little blue book with its pages edged in gold and move on to the next thread. Christina Rossetti can keep her goblins. The allusion to Goblin Men in that episode certainly did make that a creepy moment. One Rossetti poem (Promises Like Pie Crust) once spoke to me, but I haven’t really ventured beyond that. I do like literary references in Doctor Who. He has seriously read everything! I read that poem I think in a picture book ages ago, and it was really lovely/creepy in that. I thought that episode was SO terrifying! One of the only ones where the Doctor was truly, completely helpless.